Newark is surrounded by important federal and state highways that bring automobiles, trucks, and buses directly into the heart of Newark and its outskirts. One of the old ways to get into town was by the Lincoln Highway which wound its way from Jersey City, Newark and Trenton west to California. Little is known about the Lincoln Highway but it was part of the 'old' way to New York and involved a slow access across the Meadowlands and clumsy draw bridges, all of which changed once the incredible Pulaski Skyway was completed. To learn more about our modern roads we drove each of them into Newark on a recent rainy Saturday just to record personal impressions of the highway. First I tried to drive and keep notes at the same time – not a good idea! Then I had a friend drive me while I took notes – much better and safer. Here are some observations made while driving 35 mph, a dangerously slow speed for such a fast highway system. Route 22 has the impression of being nearly antique, designed for an earlier age when cars and trucks were smaller and slower and speed was not all that important. As we entered the city, we saw a heavy concrete overpass surrounded by billboards. Soon, we passed under a low cement bridge in very fast, tailgating traffic. To the left on the hilly side of the road were stacks of railroad cars loaded with containers coming from or going to the port. In the distance were three 1960s vintage glass apartment houses of the city's Weequahic section. The right side of the road was Weequahic Park with its heavy green foliage, shimmering lake and surrounding green grass. Soon after passing that point we came across another forest, this time an assortment of brick warehouses and factories—a mixture of industrial and commercial facilities. A melange of roads leading into town or south and west to the airport came next. The airport, one of the nation's busiest, was at the end of our route. Route 21 or McCarter Highway, named for Uzal McCarter in 1934, was described early on as a 'swift and direct means of reaching Routes 25 and 29 from towns along the Passaic between Belleville and Paterson. Its six-mile route into Newark superseded New Jersey Railroad Avenue, Ward Street, Cherry Street and parts of Ogden and Riverside Avenue.' Our Saturday journey from the Belleville line began at the City of Newark sign on the road's west side as we passed an abandoned factory, a rusting storage tank and a railroad overpass with a portion of it cut out for modern trailer trucks to pass underneath. In the background a little up the hill to the west, is the impressive Seton Leather Company. Nearby, is the well-maintained Schiffenhaus Company currently celebrating its centennial. The southbound lane of the Chester Avenue exit pointed to Mt. Pleasant Cemetery on the opposite side of the road and to more abandoned factories. At this point, the road is double-decked. Looking straight ahead, you experience your first impression of commercial downtown Newark, the Passaic River by its side. Some of Newark's tallest skyscrapers sparkle in the sunlight. In the evening, the familiar red Mutual Benefit sign, the green First Union sign, the marble shaft of the Prudential Building, the art deco crown of the Lefcourt Tower and the Georgian design of the National Newark Building capture the skyline. On the left is the large Newark Asphalt Company, and on the west side the refreshing green of Newark's historical Mt. Pleasant Cemetery, the final resting place for many of the city's leading 19th and early 20th century citizens. Immediately on the left is the abandoned and partially burned Clark Thread Mill complex, some of its bricks still strewn along the gutter. A few hundred feet ahead is the U. S. Box Company with its two-story multi-paned windows. It, too, was once part of the Clark Company. Down the hill along the riverfront is an enormous building bearing the sign Newark PBA (Patrolmen's Benevolent Association). Just north of the Clay Street Bridge is a wonderful 19th century collection of buildings belonging to the important Watts-Campbell Company, one of the nation's best known and oldest machine shops. At Clay Street is the bridge bearing its name. On the right, one block away, are the Broad Street Pavilions, once part of the Colonnade Apartments. At McCarter and Clay, the Tony Pallet Company has stacked it product two stories high. Next you pass under the new Route 280 exit, designed to facilitate traffic for the city's new cultural and sports complex. After passing under Route 280 and the NJ Transit tracks, you see the new kid on the block, Riverfront Stadium, home of the Newark Bears. Proceeding south of the stadium, you pass the towers of the former Mutual Benefit Life building, the art deco style Bell Atlantic building formerly New Jersey Bell, and the First Union Bank. On the left is Seabra's Rodizio, a new Portuguese restaurant on the former site of Don's 21. At Fulton Street is the classical facade of the old Progress Club, now a Masonic lodge. At Rector Street you pass Science High School, one-time University of Newark and Library School of Rutgers Newark and once part of the Ballantine Brewery before it moved into the Ironbound nearly a century ago. At the New Jersey Performing Arts Center there's a sign announcing programs. The center itself, with its field of flowers and lush green lawn, is a major cultural landmark for all New Jersey residents. St. John's Roman Catholic Church, Episcopal House, Don Pepe and One Newark Center, site of the Seton Hall Law School, and the Newark Club, at the important corner at Raymond and McCarter, occupy the next stretch of the highway. At the southwest corner is 1100 Raymond Blvd., once again under renovation. Across the street is the Gateway Hilton and Gateway Center, connected by skywalks. Here a great amount of commerce is concentrated in one of the state's major office centers. After crossing Market Street, you find the old Newark Warehouse Building, once home of the Central Railroad of New Jersey. You then pass under streets named for Hamilton and Lafayette on their historic visits to Newark. A block east is the greatest railroad station in New Jersey, Pennsylvania Station of Newark. To your left are dozens of PATH cars lined up in back of Pennsylvania Station almost all the way to South Street for the return to New York City. 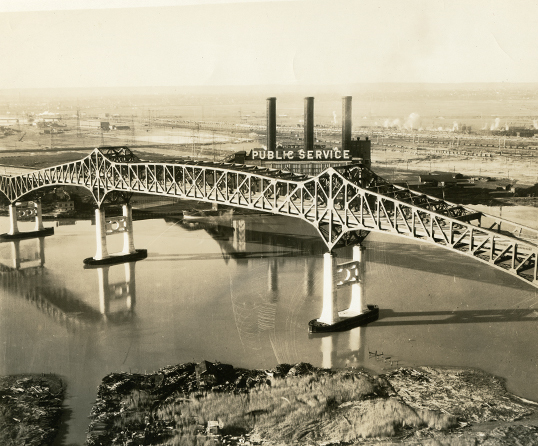 One of the engineering miracles of the century, the Pulaski Skyway was dedicated on November 20, 1932, connecting Newark and Jersey City. It was constructed to carry traffic into a new era. With its completion the long travel delays through the meadows and across two drawbridges ended. A trip that could take an hour or more was reduced to minutes as vehicles traveled 13 miles over marshes and rivers on bridges which reached the height of 200 feet above the Passaic and Hackensack rivers. The skyway was heralded as 'the longest high level viaduct in the world.' When it was built, it was the most expensive facility ever erected on two cantilevered spans over rivers, using 88,461 tons of structural steel at the cost of $6 million a mile. As you approach Newark from the Jersey City end of the bridge, you are greeted by a breathtaking view of the city. As you follow the sign, 'To Newark,' you often pass through white clouds of steam emerging from a nearby factory. Off to the right is the new Essex County Incinerator with its blue walls and tall smokestacks. Descending the ramp onto Raymond Boulevard, the roadway is surrounded by lush green sumac and by a sign pointing to Newark's multi-quad cinema. As you approach Newark from the south by way of Elizabeth, you pass Newark International and Port Newark. At the Airport, you find the new monorail station, endless acres of filled parking lots, terminals and hangars. To the left is one of the nation's busiest breweries, the regional home base of Anheuser Busch, with its giant flying eagle sign flashing white and red amidst puffs of spiraling white steam, a regionally illuminated landmark that pilots once used as their signal in approaching Newark. Continuing northeast on Routes 1 and 9, and veering to the right, you are on a 13-mile nonstop trip along the Pulaski Skyway, beginning a somewhat breathless ascent from Newark over two rivers and meadows to Jersey City that leads to the Holland Tunnel and New York City. As a very small child I remember riding in the front seat of a ‘30s automobile with my mother, driving into what I thought was hell on my first trip into 'the city.' I don't remember which of us was more scared. Another entrance into the city is by way of industrial Frelinghuysen Avenue through the city's manufacturing and distribution core. When you come to town this way, realize just how industrial Newark still is. Huge factories of all types surround you, although many have moved over the years outside Newark. Others have stayed and new ones have appeared. If you have your car inspected, you are familiar with the Division of Motor Vehicles building in the center of the district. In recent years much has been done by the city to improve the area with a pumping station to control frequent flooding and the repaving of the street.